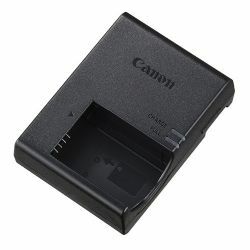 Get your battery back in fighting shape with this LC-E17 Charger from Canon. It's compatible with the LP-E17 lithium-ion battery pack for the EOS Rebel T6i or T6s DSLR camera. The charger features a fold-out, 2-prong North American plug for a wall outlet. It is included with the cameras and offered here as a spare or replacement part.